The "A" Series commercial diaphragm meters comprise a range of positive displacement gas measurement devices with capacities of 400 to 1000 ft3/hr (11m3/hr to28m3/hr). These meters use proven diaphragm meter technology in a 3-chambered design to provide accurate measurement across their respective flow ranges. Long-life and low maintenance are assured by the combination of a self-lapping orbital valve, a one-piece seamless diaphragm, and few moving parts. Careful attention to design makes them compact and lightweight for their capacity ratings. 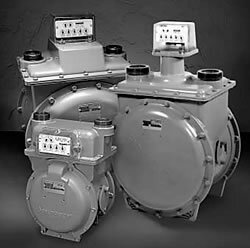 These meters are intended primarily for use with natural gas, but are compatible with a variety of non-corrosive dry gases. A compatibility listing is found in the table at right. For gases not listed, contact ISTEC Corporation.